Did Santa (or Hanu-claus) bring you a new PC? Wow, you must have been good this year! Of course, with a new computer comes new questions--and maybe even new problems. This is especially true for users who aren't particularly tech-savvy (sorry, Mom and Dad, but I'm looking at you). What these folks need is a helper, someone who can help install software, set up printers, remove viruses, and help with everyday computing issues. And not just for new computers, but for existing ones as well. I'm flattered that you thought of me first, but I was actually thinking of Comodo's GeekBuddy, a remote tech-support service that can connect to your PC for all your help and troubleshooting needs. GeekBuddy provides live, real-time help from a remote support tech, and does so 24/7. Among the services offered: virus diagnosis and removal, PC tune-ups, software and printer setup, printer and PC troubleshooting, ID-theft protection, and even help setting up e-mail accounts. The only wrinkle, of course, is if you're having a problem with your Internet connection, or the virus/malware you need to have eradicated somehow blocks the chat session. Both would prevent your "buddy" from establishing contact. In that instance, there's toll-free support available by phone. Overall, GeekBuddy sounds like a winning proposition to me, especially for those users who don't have a friend or family member they can call on for help. The service costs $50 per year, which to my thinking is very reasonable. You can also subscribe for $5 per month, and there are price breaks for 2- and 3-year subscriptions. Unfortunately (and perhaps understandably), the company no longer offers a 60-day free trial--or, in fact, any trial at all. I'd start with a one-month subscription, then decide if you think it's worth re-upping for a year or more. Collect all the photos you want to use into a single folder. The name and location don't matter, so long as you remember both. Right-click any open space on your Windows desktop, then choose Personalize. Next to Picture Location, click Browse. 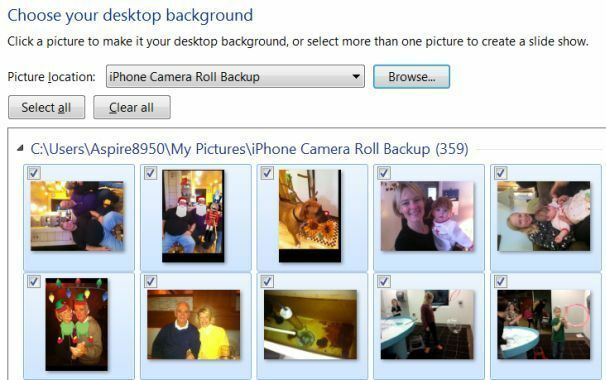 Navigate to the folder containing your desired desktop photos, click it, and then click OK.
By default, Windows will select all of the photos in that folder. If there are some you want to remove, clear their check boxes. Modify any other slideshow settings you want, like Picture Position and the change frequency. When you're done, click Save changes. You'll see a new Unsaved Theme. Click it to apply it immediately, then click Save theme and give the new theme a name.